Valentine's Day luncheon was outstanding! Michael Legend 3 was the headliner at our Valentine's Day Single's luncheon at my church. He was Outstanding!! The energy he brought was electrifying! The performance was great! He even stayed and took pictures afterwards. Amazing! Everyone enjoyed the show!!! We will book again!!!! PINK event Great performance by Micheal Jackson 3Legends!! We have an annual event every year at the beautiful eMbers venue in Rensselar IN. to raise money for cancer victims with our PINK event ( PINK for Sam) and this years entertainment was fun, energetic and unexpected! Micheal Jackson 3Legends did an outstanding performance as he kept the attention of the audience and interacted while performing with our guests! We would definitely recommend him for ANY occasion! Thank you again for all you did from booking till the end. Such an Awesome guy! 💗 Bonus performer! We loved every minute of his time with us. He was on time and helped make out Masquerade Ball an absolute success. Thank you so much! We recently hired “Michael” to perform at our company Christmas celebration. Prior to the performance, everything was handled professionally. The performance was awesome! I looked around the room and there wasn’t one person that was not enjoying the performance!! Everyone got a kick out of the after performance photo ops! Would definitely recommend! The performance by Jovan Carter impersonating Michael Jackson was amazing! We had 60 people at our party and everyone loved it! Jovan was also great about follow up and communication. Would definitely recommend this! Jackie Wilson impersonation was excellent. I was proud and elated to present such a show to my friends and family. My friends are still talking about my party. We were all sooo excited to have a Jackie Wilson impersonator entertain us. An excellent dancer sliding, splitting, and moving across the floor like lightening. I would definitely recommend him and use him again for myself. The performance was awesome, and the guests at our party gave many compliments. He was on time and ready to go as scheduled. Very entertaining my daughter really was surprised and all my family and friends! Jovan did an AMAZING job performing for my brother in law’s pre wedding party! He got the crowd engaged and everyone was HYPE! Song selection was great! If you are looking for a MJ Performer look no further! Jovan is IT! Jovan Carter recently performed at an adult birthday party for me. He did James Brown followed by Michael Jackson. The costumes were good and this man can dance! He really had JB and MJ moves and performed with such energy. All of the guests enjoyed the performances, even the hotel ballroom staff. My guests were talking about it well after he left. Jovan arrived on time, was professional and pleasant to work with. I highly recommend him!! We hired Jovan for an outdoor cocktail party. He arrived on time and did a fabulous job entertaining the whole crowd. Everyone agreed he did a great job. Would highly recommend him, and would hire him again! I would definitely recommend Jovan Carter with confidence and enthusiasm for your next event! He worked the party as the King of Pop in a way that was inclusive of all present; inviting even the meekest to engage with the energy he brings! Perfect choice for the our 80’s theme party! He had a great performance. A real showman. He used all 256 feet of our stage and then some when he engaged the audience. Audience loved him. Jovan came to our summer camp program we provide for our school-aged residents who have complex and special needs. The kids absolutely enjoyed his performance, he was very energetic an hope and kept the fun going. I hope we can have him again for next year! We were very surprised of the entertainment. But was a 5 star PLUS!!!!! He went over and beyond! A must have!! You should have seen everyones face when MJ appeared from the smoke of his fog machine! There was one kid who followed him for the entire show and was copying all of his moves, he was great with all the kids, and he even took time to speak to everyone and take a few pictures. But above all his performing is out of this world, I have no idea how he can move his body like that! A must have! Where can I start? Well first of all, 3 legends performed this day for my son's 10th birthday party. 3 Legends was very courteous and professional. Communication up to the date of the event was timely. The performance was unbelievable! 3 legends has moves!! He made my son's mouth drop because he is such a Michael Jackson fan! If you are in search of the best MJ impersonator in Chicagoland, look no further. You will be hightly impressed! OMG! AMAZING PERFORMANCE! MADE OUR WEDDING NIGHT!!! We wanted to make our wedding super fun and engaging, so we started looking for some unique performance artists in Chicago. Jovan had simply amazing reviews and the videos of his live performances were super nice. We were expecting it to be a fun 15 minutes show for our friends and family to relax and enjoy. Who would have known that Jovan would be the star of our wedding night? You should have seen these surprised faces when "Michael Jackson" slid through the floor, no one was sitting at this point, everyone got up on their feet and started dancing, singing, clapping. Our niece was bawling, MJ is her favorite artist. 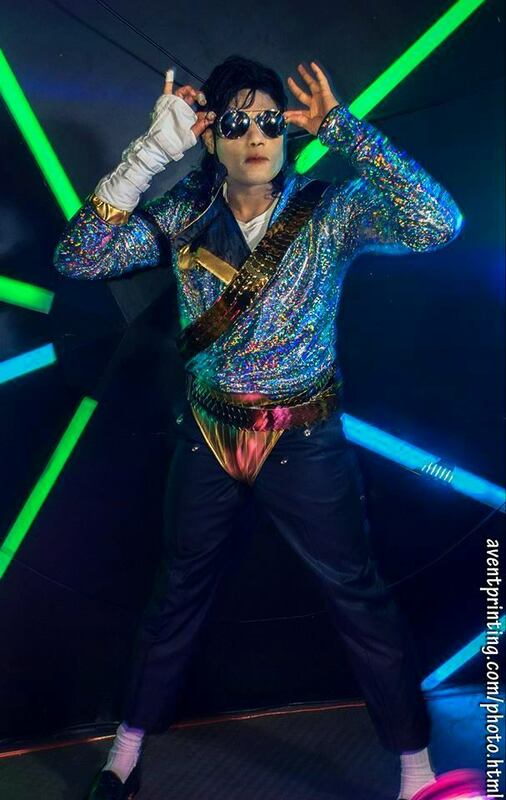 Jovan moves identically to MJ, he has an amazing rhythm, style and he was actively engaging with the audience, he changed his routines and costumes, and people went crazy :). The performance was AMAZING! You definitely have to see him live, to experience the full atmosphere. We had so many people come up and ask us "where did you fund the guy, he is amazing"! MJ set the right mood for the dance floor, people were ready to dance and they rushed to the dance floor after his performance. Not to mention that our friends, who had a wedding 2 weeks after, also hired Jovan :) we were pleasantly surprised to see him at their wedding since his performance brought us so many great memories from our own wedding. Thanks, Jovan, you are the best! Overall experience was phenomenal and amazing! Would fully recommend since the performance was outstanding and dance moved exactly like Michael Jackson in real life! My Sis had a surprise party and this was an excellent way to celebrate! 5 Stars! Jovan AKA Michael was absolutely wonderful the kids loved him and were THRILLED with his performance! Thank you so much!! Everyone loved it! Lovely & quite interesting. Brought life and much fun to the party. The kids were so amazed! The Dancing was awesome! How the hell does he move his feet that fast?? The show was fantastic. Everyone was pleased and they kept hollering Michael! Michael! This was for my sons' wedding and he was floored. Jovan did a great job! Very entertaining & my daughter had a great birthday surprise!! Was great! Very nice. Great with the kids. Just all around Great Dancer. We really enjoyed the show . My daughter does not like people in makeup or people in costumes but she loved the show! Thank you! Amazing performer with tons of energy. All 3600 Kids & Adults in attendance absolutely loved the show! Un Buen espectaculo por un buen precio para todas las edades. We all really enjoyed the show. Such a nice young man. Will definitely recommend him. Linda Patrone - Hilton Indian Lakes Resort. We enjoyed the dancing. Very Professional & a great Entertainer. You catered to the audience and had such a gift! It really made our party a night to remember. He was a huge success. Michael (Jovan) was awesome we only booked him for a brief appearance and I only wanted one song. He told me that if he only did one song the crowd would want more. Well I didn't listen and sure enough he worked the crowd into a frenzy and after the one song everyone was chanting ENCORE! ENCORE! so he extended his performance per our request. He was amazing & I will definitely book him again!!! Will be having him back for sure! I enjoyed the show. Was very good, got the crowd going. MJ was wonderful. He performed at my mother's 65th party & turned the crowd out! Truly spectacular. The James Brown & Michael Jackson Show. This show was extremely fun. Jovan is professional good and a very smooth entertainer. Very entertaining, energetic, great experience! Thank you so very much. Really enjoyed this show! I would highly recommend him for any event! Jovan's performance was amazing. His moves were just like Michael's and we all thought we were watching the real thing! Everyone had a great time and loved it. I would highly recommend him for any event. A show for my parents' 60th Anniversary! This was the best show. Everyone felt as if Mike was here himself. I recommend you for anyone looking for an MJ Impersonator. This was the best wedding ever! We Loved the sow very Fun & entertaining. So much fun! We Surprised my sister for her wedding and she absolutley loved it. Everybody ate it up! He was a good entertainer. Worked the audience well. Really got the crowd involved. High Energy. Very Entertaining. I would recommend again and again! Jovan was a fabulous entertainer. The kids loved his show and so did the adults! I Love the show. He really put on a good show, I highly recommend. Thank you. What a way to cap off our 40th birthday party!!! Jovan did an awesome job! We had him at the Waldorf Astoria Hotel and he really capped off the celebration. He's very professional & has truly mastered his craft. Att! Great night and performance for our 50th Birthday party. loved MJ. Everyone loved watching "Michael Jackson" in our basement! We had such a great time watching Jovan perform at our family retirement party. He was thoroughly entertaining to all - all ages. Thank you Jovan for such a great performance. We really enjoyed the show Mike did such a great Job!!! People on their feet and really enjoyed the show! Hired to do a Valentines Day surprise for my Wife. She loved it, Very surprised. Everyone at her work place raved about the performance. Thank you Jovan for an excellent show. We Loved the show and everyone had a great time. The show really made our party! The show was very entertaining and kept the people entertained. The dance moves were very realistic and authentic to the real thing. The music was nice and loud to encourage the audience to dance along with the show. The Kids at Trinity Lutheran School loved him as well as the parents!! He is talented engaging and very energetic! We Loved having him come to Our Lady of Victory! Will bring you back again and again! Jovan was great with the kids and very professional. I would hire him again because after all he danced great!! We had such a good time watching you. You are a great performer. Hope to see you perform again soon! Best part of the Party! Best part of our Party! If you're looking for fun entertainment, you've found your guy! Professional and great performance! The best! Michael Jackson was at our wedding! Lol. It's pretty much the talk of everyone there. At one point, I took a second to look around and everyone is glued to this guy! And 50% of the guests had their phones out. He carries Michael Jacksons memory to the max in every move! Jovan's talent is tremendous - His energy captivated the crowd - Everyone enjoyed watching his artistic dancing MJ style - !!!! He carries Michael Jacksons memory to the max in every move - Thank you! He absolutely made our sons birthday so special. Our 7 year old son was so confused he said "Mom I thought Michael Jackson dies when I was 2!" Very Entertaining, Energetic and REAL!!!!! October Fest in Richmond, Indiana, Blown away with performance. My husband is a huge MJ fan and to see such a proffesional impersonation of Micheal Jackson was very exciting.....So personable I was celebrity struck and honored to take a few pictures with MJ IMP, Thank you J for a great night... The Jacksons Connersville, Indiana. Best bday ever ever ever in my life!!!! We loved the show. My friends are already telling me they would like to book Jovan for their next event. Great job! His dance steps were out of this world, Very Talented! I am so happy with everything! He's kind, great customer service, and an amazing entertainer! It was like I was meeting Michael for the first time... and how you can move like that I don't know but I know that we really enjoyed all the performances and thank you for sharing your remarkable talent for our wedding. I highly recommend if you are looking for a quality Michael Jackson Impersonator to hire for any party. Great Performance that gives audience a peak into the history music and dance of the greats, You can see the artistry of Jackie Wilson, the funk of James Brown & how beautifully MJ incorporated their styles to become one of the BEST performers! Great show! Wonderful!! Jovan came to our facility this evening and our residents truly enjoyed his performance. Before he was even done they were asking if we could have him come back. We will sleep good tonight from just watching we are all wore out, he really gets a workout. His dancing is superb. The first 3 reviews are right from the childrens' mouths! 1. "I loved all the songs and Michael Jackson is my idol"
2. "I loved the dance moves that he did"
3. "the dancing was awesome"
Ms. Mary - Thank you for your performance. It was truly enjoyable, and thank you from the class of Tutor time in Tinley Park for taking the time to perform. Today at Tutor Time the kids really enjoyed the show! We all were dancing and singing along! One of the best 4th of July parties we have ever had! Just Unbelievable you did a wonderful job thank you for performing for our 4th of July party! The Performance was absolutley mind-blowing and riveting. The audience demonstrated attentiveness, enjoyment, and satisfaction. Many residents were familiar with Michael Jackson and it was such a pleasure to honor the good times in MJJ life by joining in on the show. The performer was highly talented with a great personality to match. The Show was Just Great! IT was like A Las Vegas Act. Thank you for sharing your talent with our group today! We appreciated your flexibility with scheduling this event and your obvious performance expertise. Among the many compliments that was given what stands out is one of the ladies saying "He moves his entire body" and another said "It's amazing how he channels him like that". We enjoyed your performance and wish you well in your blossoming career. I really enjoyed the performance for my birthday. Thanks a million! Thanks for a great show You helped us to make a memorable birthday and farewell bash. If you ever come to Sweden you know where to find us! Thank - U Thank -U Thank - U!! We really enjoyed Jovan! He did a good job performing at our facility, they enjoy it I so much that after the show 2 of our seniors waited outside his dressing room almost 15 minutes just to say hi and shake his hand! And residents I never saw dance were just moving and bouncing in there seats! The staff and all the residents here at Montgomery Place really enjoyed the show, one of the ladies said she could have listened to the music all day. It was wonderful , fantastic show. We appreciate you in all facets! Just wanted you to know how much the residents enjoyed your performance. You truly have a gift to make people happy. Out of all the entertainers we have at our facility Jovan is the one that they ask about the most. What I liked about his show was number one Michael Jackson is someone everybody can relate to, then there is this energy he has, he's also very limber and blessed with talent. Thanks again! I have to say that this young man Jovan is one of the best dancer's I have seen hands down. Very few people has it and that takes natural talent and work! I know because I was a dancer for many years myself, and I taught dance for over 25 years but I have never seen anything like this. Wish you all the best and we will definitely be calling you back. Jovan presented an superior performance at my daughter Leah's birthday party. All that attended were very entertained.This was one of the best parties that my Little munchkin had. Thank's to Jovan's Michael Jackson impersonation. The night was a blast! Michael J was very professional & talented. The entire family from grandma, kids and adults all enjoyed the performance. I give him all A's and very good with kids! The best Michael Jackson impersonator you will see. To see my 3 year old giggle, look at him look back at me, smile, and give him a hug on her own is totally worth it! WOW!!! is all we have to say after seeing this man perform. I mean this guy know he can dance!! We actually found him on this site and he so exceeded our expectations! We originally planned to have just a DJ and a couple of friends sing for our anniversary of 11 years. But literally just a few weeks ago I came across this site and I have to say what a treat! And oh all my young and I mean ages 2-5 year old nieces and nephews stopped in their place to watch the entire show, they were on the edge of their seats! I couldn't believe that Michael has the same affect on a new generation who some of them weren't even alive when Michael was alive as he did on us when we were little. Oh did I say he can dance? We loved it!! AMAZING ENTERTAINER!!!! Very professional and always give a great performance. Definitely a MUST SEE!!! Never a disappointment!!! Best Michael Jackson Impersonator ever! Just want to say thank you Jovan for making my wedding reception what it was. You are very talented and with so much energy! We just looked at you on our wedding DVD SO happy we have it all recorded! Jovan performed for my niece birthday party last year and we told my sister we wanted to have a Michael Jackson Impersonator for our wedding since we grew up watching Michael Jackson, have all his songs, know all his music kinda thing.... We couldn't have asked for a better Michael Jackson Impersonator and trust me we have seen many!! Thank you again! He really knows how to put on a show! I used Jovan for an outdoor event open to the public last summer and he put on an awesome show he was exactly what we needed and I always recommend him he looks like Michael, he's got the moves, the stage presence and his build one of my colleagues said he even walks like him! Truly the best Michael Jackson! I am an Activity Director at a Nursing Home and we needed someone to do an event at the last minute I called Jovan and he is a very talented young man his show packed the house! I love when not just our residents but the staff enjoys the show. After his show I told everyone give it up for the best Michael Jackson! THE SHOW: ‘I was proud and elated to present such a show to my friends and family. My friends are still talking about my party. We were all sooo excited to have Jovan entertain us. An excellent dancer moving across the floor like lightening’. SERVICE: "Jovan arrived on time, was professional and pleasant to work with. I highly recommend him!!" Michael Jackson 3 Legends is a Tribute Artist who began his musical journey at age 12 playing percussion for a Performing Arts School. When he won his second talent show by the end of High School (the first as Michael Jackson and the second as Jackie Wilson) it became clear what his passion would be. Today he is showcased either as (1.) "King of Pop", (2.) the "3 Legends" of Jackie Wilson, James Brown, and Michael Jackson, or (3.) other combinations of these Acts. Nevertheless as an Artist in his own right with each new show comes a new performance and one to leave the audience completely fulfilled. Using a DJ or Sound Technician? Then just press ▶️ on our iPad. Privileged to have been and continue to be influenced by many great Entertainers and here they are: Charlie Chaplin, Fred Astaire, Sammy Davis Jr.,The Nicholas Brothers, Jackie Wilson, James Brown, and Michael Jackson. Let’s discuss options and find what arrangements will work best for you. – John & Shelly T.